Elder Care and Life Care Planning Attorney St Petersburg | DeLoach, Hofstra & Cavonis, P.A. Need Help with Your Aging Loved One? You Found the Right Place! Can my loved one stay at home? If they cannot stay at home, where will they get the right care? How will my loved one get right care without losing their home and life savings? How will Medicaid or VA benefits help pay for care? How can you be sure your loved one is getting the right care? We created our Life Care Planning team to assist you with all of these questions and more. 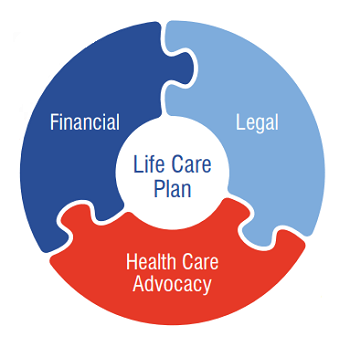 Life Care Planning is an integral part of our Elder Law practice. For some Elder Law attorneys, their practice consists primarily of asset protection in the face of nursing home expenses. Our Life Care Planning practice, however, does much more than merely protecting the family's assets. Life Care Planning recognizes that you and your family need help to navigate the long-term care maze. When you or your loved one is facing imminent long-term care, dementia or other age-related concerns, our Life Care Planning practice combines asset protection, estate planning and care coordination to answer all of you and your family's concerns. With a Life Care Plan, you receive the right care sooner, maximum independence for as long as possible, and the ability to age with dignity. Your family gets help finding the right care and services; guidance with legal, health care and long-term care decisions; and peace of mind that comes with knowing you are secure. If you are dealing with Alzheimer's disease in your family, please download our free Guide to Alzheimer's Care. Life Care Planning describes how our amazing team will meet the elder’s medical, long-term care, legal, and emotional needs during long-term illness or incapacity when they are having trouble staying home. Peace of mind because the right to quality care is protected. What makes a Life Care Planning (LCP) attorney different from a traditional elder law attorney? When an elder is no longer able to live at home, an LCP attorney uses an Elder Care Coordinator to help the elder and his or her family obtain good health care. We employ a full-time social worker, Gloria Centonze, whose sole job is to act as a client’s health care advocate. Traditional elder law firms focus solely on asset protection planning while an LCP firm’s primary goal is to get good health care for our clients, while still providing asset protection options if necessary. What is an Elder Care Coordinator (ECC)? When would a Life Care Plan make sense for me or my loved one? When you or your loved one is no longer able to live at home safely, our team is able to help you and your family make the correct health care, placement, legal and financial decisions. Please give us a call if you need help with your aging loved one. Life Care Planning is a unique, elder-centered specialty of elder care law that features an interdisciplinary team that works together to identify present and potential future care needs, assist in locating appropriate care, and helping ensure high-quality care. We recommend starting the program as soon as there is evidence of, or a formal diagnostic of an impairment. If you have been suddenly thrown into the position of having to coordinate medical and housing for your loved one, you may be confused and anxious fearing you'll make the wrong choice. With so many options for assisted living facilities and nursing homes, how do you know you are selecting the best one for your situation? How will you pay for it? Deciding where your loved one will live is one of the most important decisions you will make. If you are looking to create your own estate plan or make changes to your existing documents, you will not want to start without a copy of my book, the Don't Lose Your Nest Egg to a Florida Nursing Home, which you can download for free.